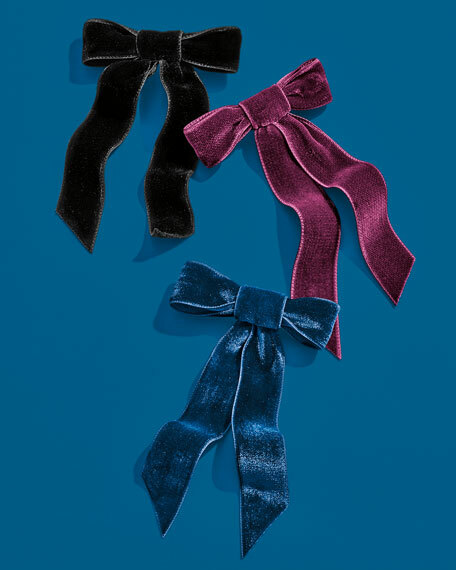 Jennifer Behr velvet bow barrette. Ideal for both evening and everyday wear. Jennifer Behr takes the rich and evocative history of headpieces and jewelry and turns them into wearable contemporary art. Hand-painted flowers, prong-set Swarovski crystals, rich golden tones, adorn a range of styles. Whether you're looking to add edge to your daytime look or bring elevated glamour to your occasionwear edit, Jennifer Behr should be your first port of call when it comes to both jewelry and headpieces. We love that the brand caters for those who just want to add a dash of minimalist sparkle as well as those who want full-throttle goddess-worthy adornments. All handcrafted in her Brooklyn studio, Jennifer's pieces are light in weight and easy to wear. Epona Valley "Le Hand" barrette, made to resemble a hand holding up your ponytail. Top Editors Pick of Allure Magazine and seen on multiple celebrities. Plated brass hardware. Curved 4"W. Made in USA. Jennifer Behr "Pansy" barrette. Gold tone plated brass. Made in USA. Jennifer Behr hand-painted flower hairpin. Golden plated brass. Made in USA. Jennifer Behr "Mathilde" velvet bow barrette. Rayon/nylon. Metal base. Made in USA of imported material.